Nagpur, Feb 6 (CRICKETNMORE): Vidarbha put themselves in pole position to retain the title by blunting Saurashtra's challenge on the fourth day of the Ranji Trophy final here on Wednesday. 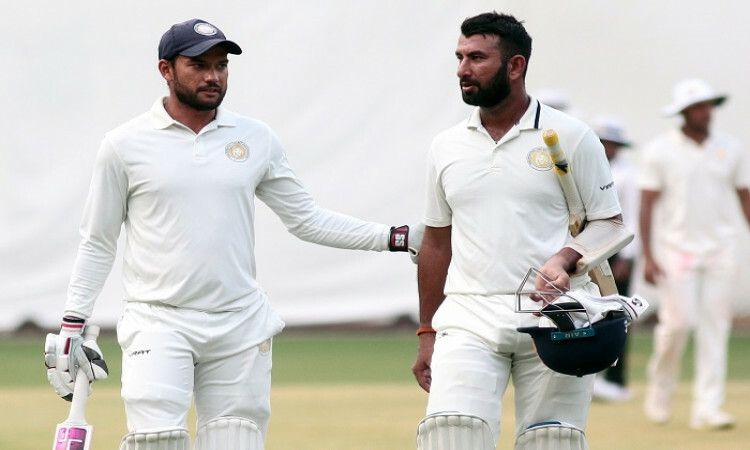 Star India batsman Cheteshwar Pujara failed for the second successive time as left-arm spinner Aditya Sarwate once again turned out to be the batsman's nemesis, trapping him leg before for a duck with Saurashtra tottering at 58/5 in their chase of 206. Sarwate (3/13 in 10 overs) was the wrecker-in-chief, also accounting for the wickets of Snel Patel, who scored a hundred in the first essay, and Harvik Desai. Going into the final day, Saurashtra need to score 148 more runs with Vishvaraj Jadeja (23) and Kamlesh Makvana (2) at the crease at close of play. Earlier, left-arm spinner Dharmendrasinh Jadeja (6/96) had cleaned up the Vidarbha top-order to hand Saurashtra an advantage but the hosts held on to reach 200 after being reduced to 147/8. Mohit Kale contributed 38 off 94 balls and Sarwate, batting at number eight, scored 49 after the hosts resumed the day at 55/2. Sarwate then starred with the ball too, rattling the Saurashtra top-order with his left-arm spin. Sarwate dismissed Patel (12), Harvik Desai (8) and Pujara (0) in his first five overs, and leaked just 13 runs in his 10 that he bowled on the day. India pacer Umesh Yadav sent back young Arpit Vasavada (5), who fished one outside the off side to be caught behind. Sheldon Jackson (7) stepped out to hammer Akshay Wakhare, completely missed the ball and was castled. At the start of the day, Jadeja scalped four batsmen, including key man Wasim Jaffer (11) and Ganesh Satish (35), in the first session. Vidarbha failed to recover even as Saurashtra skipper Unadkat got the wicket of Akshay Wadkar, who went without bothering the scorers. Off-spinner Kamlesh Makwana sent back the dangerous Akshay Karnewar (18).